I didn't manage to fit in a lot of sewing last week. First I was really busy and then I got a nasty cold. I'm OK now and moving on with the plans I mentioned in the previous post: I'm making a bag. First, I did some research. In this case, that meant looking at examples of the kind of bag I want sold in online stores (and in a real store, now that I think of it). I quickly found a shape I liked which also didn't look to hard to make. Although I was planning to use stash material (an off-cut of a black-out roll curtain, to be precise) I also looked for "fabric". It turns out you can buy that stuff, from which near-indistructable bags are made, by the meter. You know, that plastic on a woven back which is used for covers on trucks too and for good quality banners for outdoor use. The name of the material, at least here in the Netherlands, is bisonyl, the standard width is 250 cm and it comes in lots of colours. The bag I am making now is a bit of a test-case but I definitely consider buying this stuff for a later, fine-tuned, version. Sewing-wise, I had to start with the most difficult part: Inserting the zipper in a shallow U-shape. Fortunately, I could study the construction on my old sports bag. That is how I found out that the edges were bound with nylon tape and the zipper sewn in with single lines of stitching close to the edges. I didn't have a lot of material which could make a sturdy enough binding and had the right width. Just enough for one edge of the zipper, to be precise. 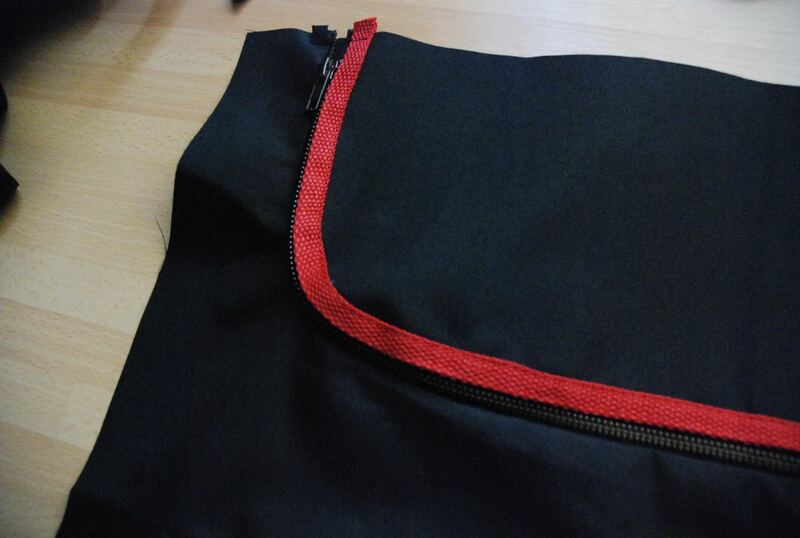 So, I decided to use it on the inside edge and just sew the zipper directly to the cut edge on the outside. It was fiddly but it worked. Like the bisonyl, my "fabric" shows its weave on one side and a smooth plastic layer on the reverse. I'm using the woven side on the outside of the bag but I thought it would be better to add a second layer, with the smooth side facing out, on the bottom. And of course, I am going to need a separate compartiment for my wallet, keys and phone. I'm making that on one end. I'll just double that piece (although I will have to use a different material on the inside, I'm out of curtain) and put a zipper in the outside. With these bits done, it is time to pick some strategic places for straps and then put the whole thing together. Remember this top I made? Seen here fairly recently, when I went bouldering with my cousin and my brother. I still like and wear it and the other tops I have made. 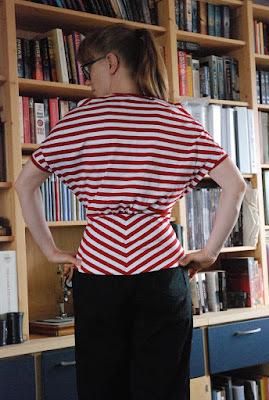 After I started making my own, I just got too fed up with the way RTW tops creep up over hips to go back. I also still wear the just-over-the-knee trousers I made for climbing and, if it is not too warm for that, the cardigans. But time has passed and life is not so kind to sportswear. This is what that top, the most recent one I made, looks like now. I don't think the fabric is of poor quality or anything like that. What you see is just the natural result of certain types of climbing. Specifically, of climbing balance-y routes on vertical or less-than-vertical walls. 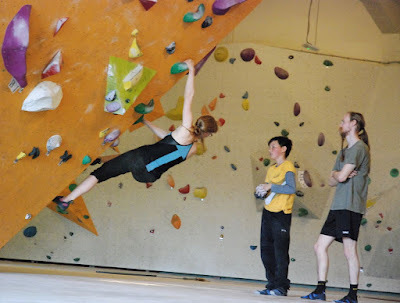 If you are in the kind of route where you have to inch your way forward between very bad handholds (or even without handholds) you have to lean towards the wall to maintain your balance. Often, when doing that, even a flat-chested girl like me can hear the fabric of her top snag on the rough surface of the wall (and I have it on good authority that the guys aren't free of this either). This happens to all my climbing tops. In short, I could do with adding some more sports clothes. I'd like one or two crop tops (which I would only use for bouldering in warm weather), two or more normal tops (in which case it would be nice to try a new pattern) and two more pairs of trousers. I think I will start with tops. So many types of lycra to choose from! For trousers, I am not so sure. I have no complaints about the fabric of the old pairs (other than that it developed holes before the stretch woven of my my RTW trousers did) but it is dark brown... I'm still not drawn towards leggings though! As usual, it is a case of "so many plans, so little time". 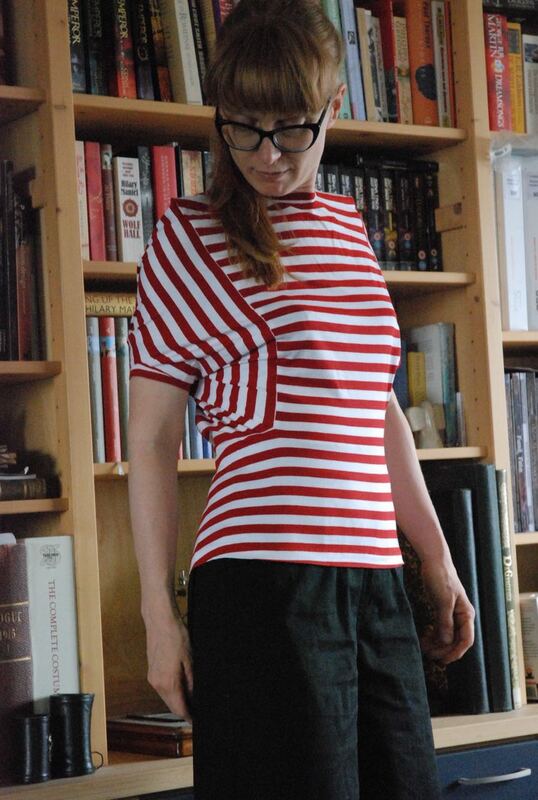 This is what that striped top looks like when worn. As I mentioned before, it doesn't allow for a full range of movement but it is nowhere near as confining as the first version. And the thing I wasn't sure about? Well that would be those points at the shoulder which came into existence as a result of my decision to graft the big rectangle for the back and sleeves onto the original shoulder seam, keeping the corner where shoulder and armscye met in the front bodice block. I could have made a curve there. In fact, I could still do that but I kind of like the points. Curves at the shoulder would weaken the impact of those stripes. Yes, the point are a bit odd but E said he thought they looked intentional, more of a design feature than a mistake. I think that is good enough for me. Oh, and it actually nice to wear. The other thing, which I made over the past days, is a new pair of slightly cropped trousers. I love the denim ones which I made last winter and thought it would be nice to have another pair. Slightly longer this time (the length of that pair had been determined by the amount of fabric I had). I had a fabric in my stash which I thought would work for it: A cotton (probably blended with something synthetic) in mid-weight satin weave with a sort of floral design woven in (in the texture of the fabric). It is a peculiar fabric. I have made fitted dresses (the most recent one is here, the first one here. They both look better in the pictures than they did in real life) from it before but I never really like the way it behaved in those: the bulk of the fabric makes skirt creases really visible and its stretch (it has a bit of stretch) always meant things had to be taken in. The fabric doesn't have a nice hand either so I've never really been tempted to make a skirt from it. Its properties might be good for trousers but there was that floral pattern... I could never imagine trousers that didn't look silly in that. Until this week that is. 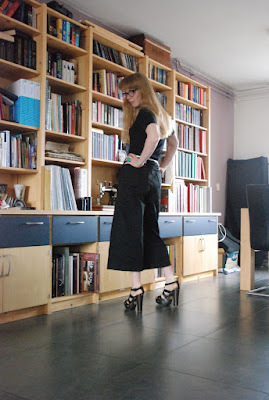 Somehow, probably because this style is sort of between trousers and culottes, I think I can get away it. 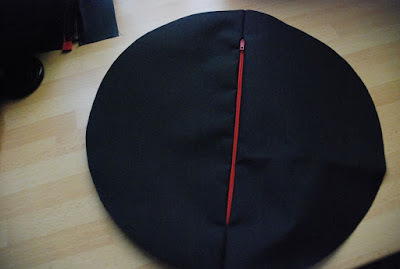 When it came to cutting out, I made some more alterations than length alone: Instead of a curved waistband just under the natural waist, I now made a straight waistband on it, I made back darts instead of a yoke and changed the the shape of the front pockets from scoop to slant. Then, when I had started sewing, I also started second-guessing myself about the fly front. The vast majority of the trousers I sew have a fly front but the combination of this design and this fabric didn't seem right for one. So, put in a side zipper instead and I am glad I did. Loose fitting and too short to reach the ankle, I suppose these won't be to everyone's taste but I like them. 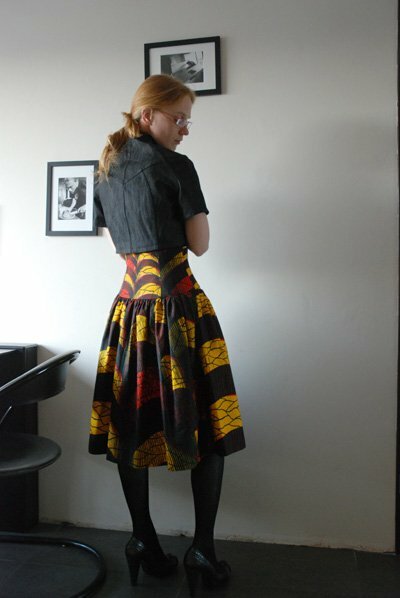 In my post about last week's Great British Sewing Bee episode, I mentioned the African wax fabric I still have in my stash. 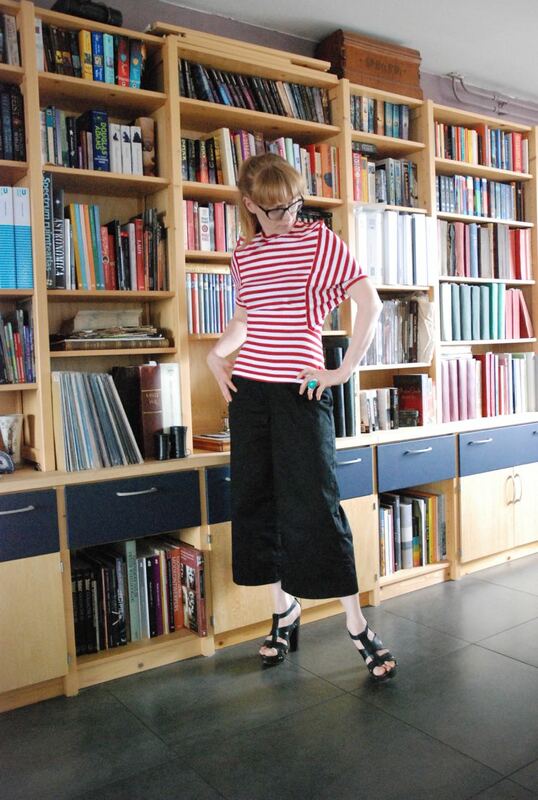 I also showed you the skirt I had made from it years ago. Watching the show and writing that blog post made me think about doing something with the remaining fabric (a fact which I also mentioned in that post). As you can see, there is a clear repeat across the length but not something you can really pattern-match. And in fact, the print looks even more 3D in the picture than it does in real life. Now, before I dug this fabric out of the stash, I thought about using it for a fit-and-flare skirt. 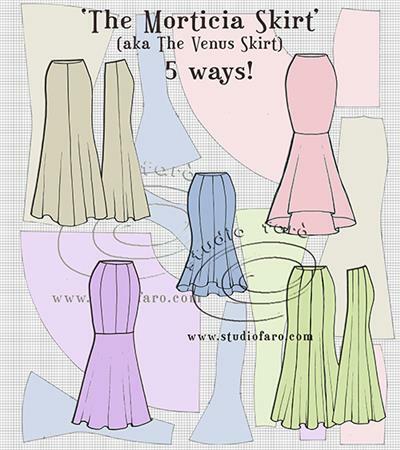 Something along the line of these "Morticia skirts" from Studio Faro (their tutorial gives the drafting instructions for all of these! 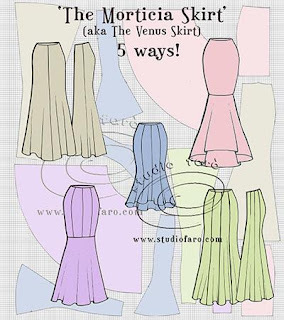 I don't need a tutorial for a skirt like this, but this is a great resource if you do). I thought the different drafting options for a shape like this would allow me to pick the one that was most suited to the print. But then, I brought out the fabric. I held it up to my body in front of a mirror and then I laid it out to photograph it. Only then, it hit me. This print is so eye-catching. Cutting it into smallish pieces for the skirt I thought I wanted would be such a waste. Even in my old skirt, which uses a fairly large uncut panel and careful print placement on the yoke, you kind of miss the real impact of the print. I think I should alternate the left and right side points to get the best shape. However, that would mean placing all yellow pieces next to each other. Not all the lines in the print are exactly straight but those dark areas are large enough to allow for a bit of cheating. I could just cut the panels, see which arrangement worked best, sew them up and then cut the waistline and hemline I need/want. It's a very different approach to making a skirt but one which would really show off that print. P.S. I'm trying to be strict with myself about adding to the stash but I have seen a wax print at the market which might suit me: Orange stalks and leaves, outlined in black on a cobalt blue background. Cotton jersey with stripes... Gotta love it! 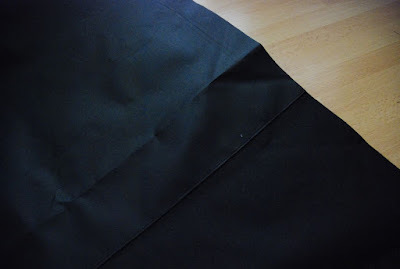 I was given about 4 meters of this fabric as a thank-you for helping with the fashion show at the high school where designer friend M teaches (I'm the person who comes in during the last few lessons before the show to make sure that everything gets finished). They had a whole pile of fabric and notions I could choose from but most were really synthetic and/or stuff I never use anyway. So, I managed to summon some self-control and didn't take more than this to add to my already bulging stash. 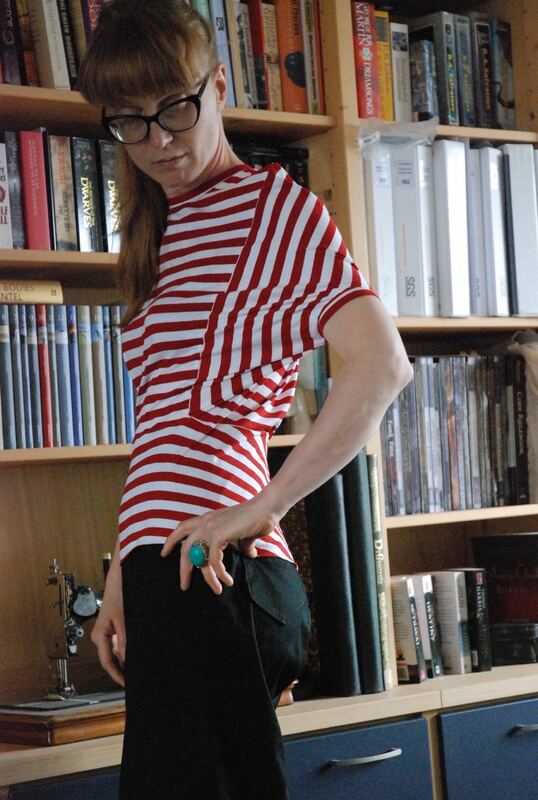 I really like sewing with stripes. Knitted and woven ones. 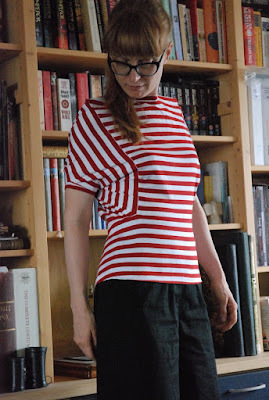 There's just so much interesting stuff you can only really do with a striped fabric! Oh, and there are loads of good classic looks which use striped fabric without trying to be clever. In fact, I have a small piece of reddish and dark blue striped jersey in my stash which I have been afraid to cut into because I have too many ideas for it... At least with this stuff, I have enough to test out the different basics and have some pattern-nerdy fun. This top, my first creation in this fabric, is of the last variety. I wanted to make a design which would really showcase those stripes and that made me realize how many things like that I have already done. A simple top with the stripes meeting in a chevron shape? 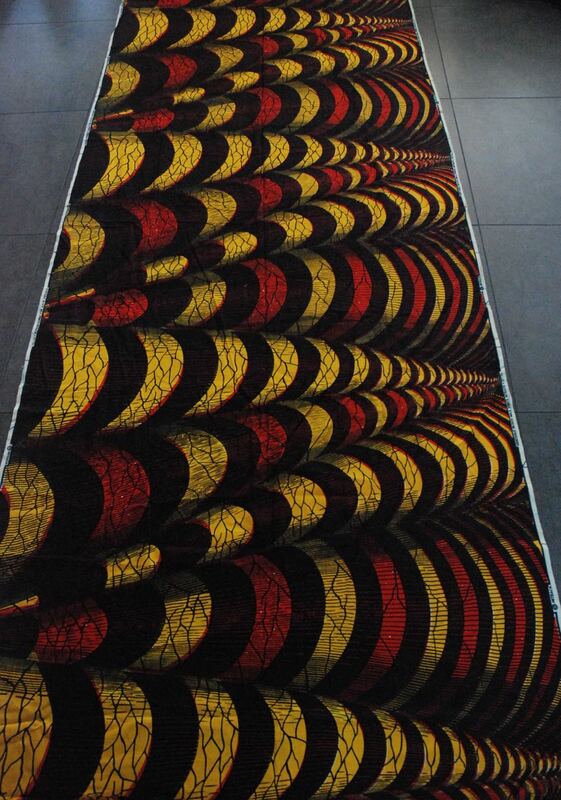 So simple and more suitable for a woven fabric. A twist top? Done that. Twice. No, I wanted something a bit more experimental, something which would be ALL ABOUT those stripes. And then I thought of some part free form tops I had experimented with way back in 2010. 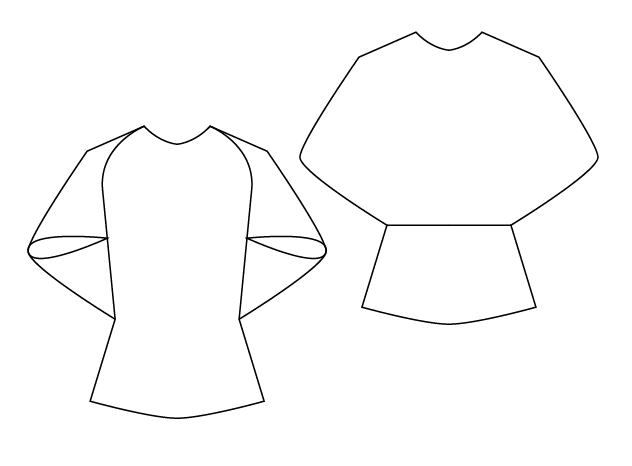 The first one started with my idea to make a kind of t-shirt using a popular super-simple shrug pattern for the back and sleeves. The original post is here but it doesn't show the shape that well. It looked like this. Only with a bit of gathering at center back but I don't like drawing gathers in Illustrator. It was a fun design but there were some wearability issues. Like just how far the top pulled up with just about any arm movement. I wore it anyway but I also continued with the experimentation. 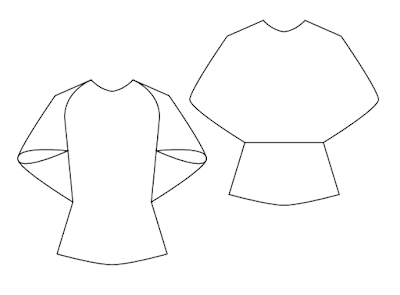 The new-and-improved version abandoned the simple pattern piece shapes to create a top with a more defined version of the same silhouette. That top is here and I even wrote a pattern tutorial for it here. I still have that one. This time, I decided to go back to that first design and alter it to suit my stripe-y fabric. Fortunately, my original pattern had survived the two pattern clear-outs I had in the years in between. There are more angles in this new design. I kept the original shoulder line of the front bodice sloper and simply sewed the rectangle of the upper back/sleeves around it. 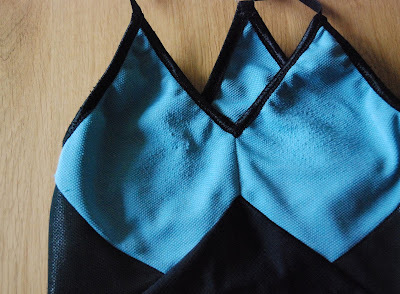 I didn't keep the original side edges of the front bodice but brought those a bit to the front. With a square corner at the waistline. For freedom of movement, I cut the back/sleeves with some extra length and made the sleeve openings not on the sleeve seam but by folding and sewing the sleeves and then cutting their corners to create openings. Oh, and I cut the lower back in one with the front bodice. 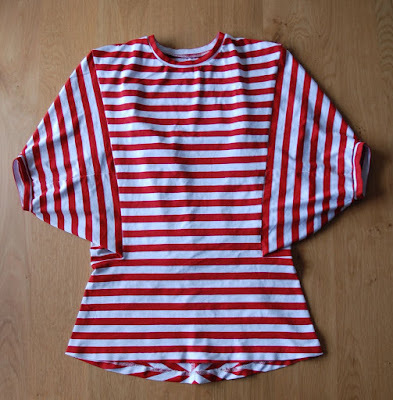 Just to make sure there would be interesting things going on with those stripes everywhere in this top. Of course, this top is not quite as easy to wear as a normal t-shirt either. And there is at least one feature I'm not 100% sure about (which you can only see when it is worn) but I really enjoyed doing this kind of random fun-with-patterns kind of thing again. I will ask E to take some pictures of me wearing this (and maybe even some next thing too) in the coming weekend, so you'll be able see how it works on a person. Oops, that was a long time without posting! I've been quite busy lately, although part of it was for fun (a weekend of rock climbing in the Ardennes!). Even too busy for sewing... After finishing that 1943 dress, I didn't do anything related to my personal sewing until today! This week was international week. A new topic for this show and it turned out to be an interesting one (they are expanding their horizons anyway, last week was lingerie week, another first). It also made me think of things I have seen in museums and on real people, things I have researched and some fabric in my stash. The pattern challenge was to make a Chinese style top, referred to in the program as a "qipao". I don't think that is correct, as far as I know the term qipao always refers to a dress (a dress which is also known as "cheongsam" or, according to Wikipedia, in English as "Mandarin gown". I thought the English name was "Shanghai dress"). 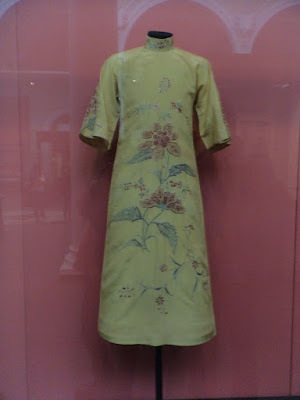 The last time I was at the Victoria & Albert Museum in London, I also had a good look at all the textiles in displays about the history, culture and art of different countries. In the section about China, they also showed the development of the qipao from a long, loose dress to the body hugging garment we know today. I only took pictures of two of the dresses. This one is from the early 20th century and shows an in-between shape. Although this qipao will fit closely over the wearer's body and legs, it still has kimono sleeves which mean a looser fit at the upper body. This one is a modern creation by a female Chinese designer (I didn't write down the name...). I think it is quite clever and interesting. 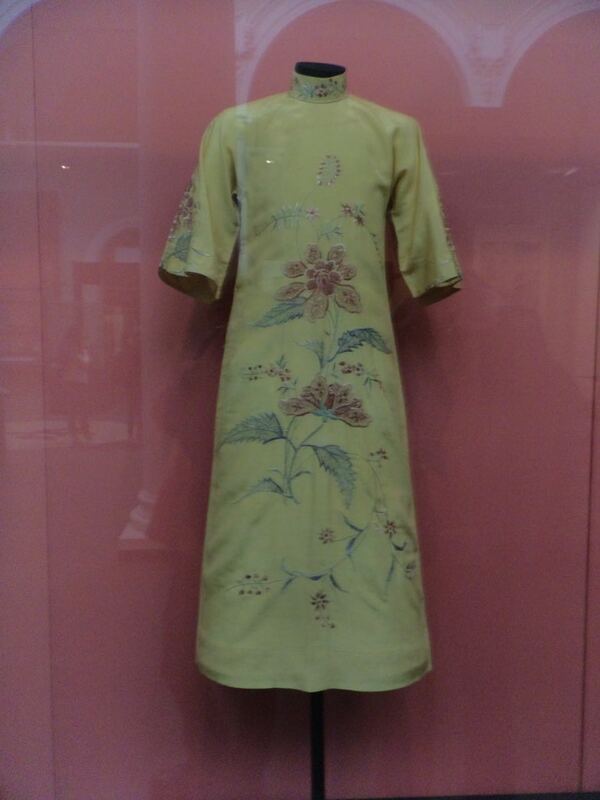 A theory about the development of the qipao suggests that it was a hybrid of western and traditional Chinese women's dresses and yet, here in Europe, it is now seen as a quintessentially Chinese garment. This dress seems to play with those ideas: The shape references both the qipao, the little black dress and even a ladies' suit. 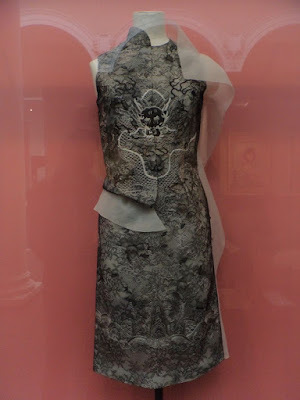 The material is black lace (a western material) over off-white silk but the the designs incorporated in the lace are those of traditional Chinese brocades (especially that dragon on the chest). I've never tried making a qipao myself. I think they are beautiful but it is always tricky to make and wear a garment which is associated with another place and not make it look costume-y. The combination of that side zipper and the diagonal, curved overlap looked complicated though! And then there was the made-to-measure challenge: West African inspired dresses made from African wax print fabric! Now, that is a material I have worked with. Most recently in last year's 1966 dress. I can actually buy some fabric like this at my local market and I'm always intrigued by the sheer variety of the the designs. 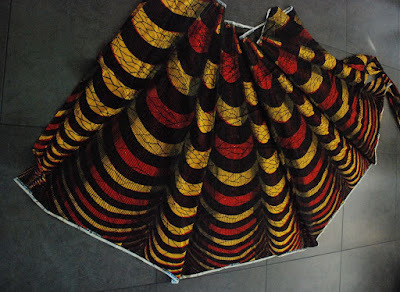 Way back in 2009 (pre-blog but on Burdastyle) I bought a piece of this material in a design I liked. I made this skirt from it. As lovely as this fabric may be, it is not something a pale Dutch girl like me can wear all-over (I thought some of the models on the Bee had the same problem). I did wonder a little bit about me wearing this West African style material but when my neighbour, who comes from that part of the world, complimented me on it, that settled the matter for me. The design on my fabric is large and random. 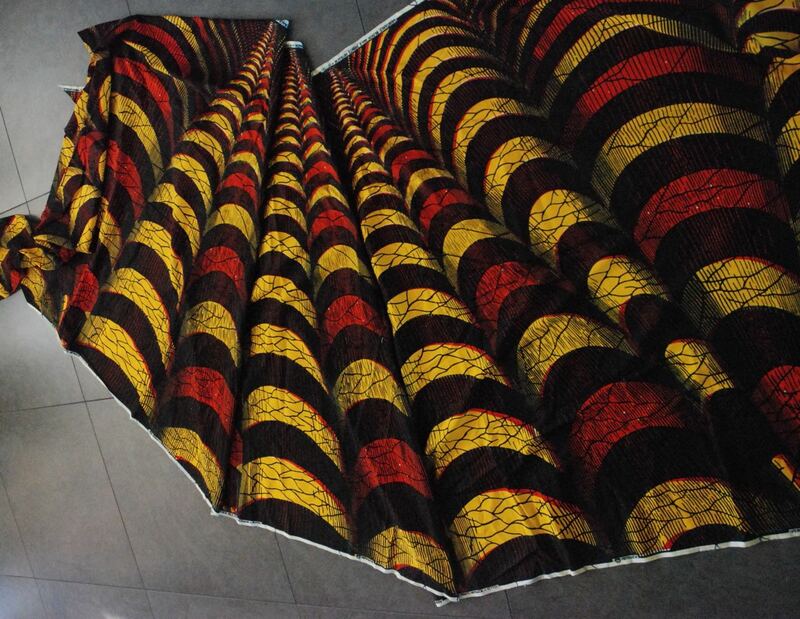 Those big diagonal lines go across the entire width of the fabric and lengthwise, the repeat takes more than a meter. Whenever I sew (and I still have more of it because you buy this stuff in set amounts, of 4 meters if I remember correctly) with this, I think about which part of the design to use where, not about pattern matching. I would still like to find another wax print in more muted colours so I could make a dress (but there's not much chance of that. Printers making this stuff know their target market and customers look great in bright colours). And this episode of the GBSB made me think of making a very different kind of skirt from the fabric I have. Something with a lot of fit-and-flare. Oh, by the way, who else thought it was probably a good thing they didn't do this particular challenge last year? Chinello would have crushed this one! 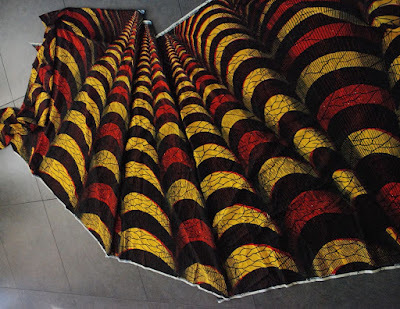 And I really liked the background story of the fabric. I would have sworn I had written a blog post about that as well a couple of years ago but I can't find it. It was pretty much the same story though: How this style of fabric developed in response to early global trade. The only thing they didn't tell on tv was that there is still one Dutch company printing this fabric for the West African market: Vlisco. I wondered if the fashion clips they showed of ladies wearing these prints came from Vlisco. The aesthetic looked very similar to their advertising. I liked the dresses the contestants made although I thought compared to the real thing they actually seemed a bit eh... tame. I was puzzled about the focus on peplums. To my knowledge, peplums are just one option in West African dresses. Just very fitted is also an option. And so are very full skirts. And the basic every-day look is a loose dress (like the ones you could see in the bit about the African saleswomen). Oh, and that criticism Patrick had on the ruffle, about how it created to much bulk on the tummy? I'm no expert but I think he is showing his roots there. Isn't one of the beauties of West African fashion its ability to celebrate the female form in all shapes and sizes? That pre-occupation with flat tummies doesn't seem to fit in with that. Tomorrow's episode will be all about the 1960's. The preview showed the kind of vintage sewing machines I have worked on in M's studio and some rather extreme fabrics. I'm looking forward to it!